Welcome to the Cosmetology Continuing Education Courses Online service designed for any licensed cosmetologists employed within the State of Texas and North Carolina. These courses are for any cosmetologist, Hairstylist, Manicurist, or Esthetician who needs to obtain continuing education credits in order to meet the State of Texas continuing education requirements; this may include Hairstylists, Manicurists (Nail Technicians), Estheticians, Licensed Specialists, or any individual who desires training. All courses have been approved by the Texas Department of Licensing and Regulation (TDLR) and have been designed for those who want the best training in the least amount of time. Highly recommended for all cosmetologists employees working in the cosmetology industry, this cosmetology continuing education course teaches and reviews the fundamental components of cosmetology safety practices. Completion of this material will enable cosmetology industry professionals and employees on all levels to implement these practices in a standardized manner within their respective cosmetology establishments. Cosmetology Edu Classes Online Service (CEC) is approved as a Texas cosmetology continuing education provider for the Texas Department of Licensing and Regulation (TDLR), provider # 1962. SHERMAN, Texas - (May 11, 2015) - Innovative North Texas-based technology company DSBWorldWide, Inc. is pleased to announce the release of Texas.CosmetologyEduClasses.com. This newly unveiled collection of continuing education courses was designed specifically to satisfy the Texas Department of Licensing and Regulation (TDLR) continuing education requirements for the renewal of a cosmetology operator license, or an esthetician, manicurist, esthetician / manicurist or eyelash extension specialty license, or a hair weaving, hair braiding or wig specialty certificate. The TDLR requires licensees to complete a total of 4 hours of continuing education through department-approved courses for licensees with licenses expiring after September 1, 2012. 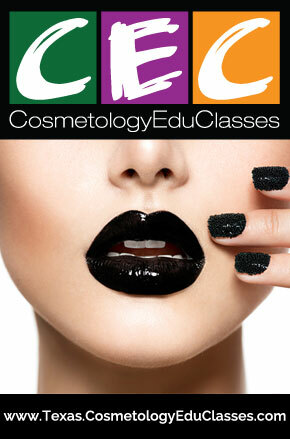 The courses are geared toward specific cosmetology interests. Each 4-hour course includes two hours of continuing education instruction in Sanitation, one hour of CE instruction in Health and Safety, and one hour of CE instruction in the licensee’s preferred specialty area, such as Skin Health, Nail Health or Hair Health. There is also an available 1-hour Sanitation course designed for licensed cosmetologists employed within the State of Texas who are at least 65 years old, who have held a cosmetology license for at least 15 years and who need to obtain continuing education credits in order to meet the State of Texas continuing education requirements for Hair Stylist, Manicurist, Facialist, Hair weaving, Shampoo and Wig Technicians. CEC even helps cosmetologists keep up with their certificate. The simple online system maintains a copy so users can log in to their account and print off another Cosmetology Edu Classes certificate whenever they need to. Texas.CosmetologyEduClasses.com is a service provided for cosmetologists employed within the State of Texas through Cosmetology Edu Classes, a subsidiary of DSBWorldWide, Inc.
DSBWorldWide, Inc. has been in business since 1999 and has designed several hundred websites integrated with their custom suite of WebItems® Software. They will continue to upgrade this service to offer richer features and applications. DSBWorldWide, Inc. is a professional creative graphic services agency geared towards providing businesses with a full range of online marketing tools and web based materials. As a creative design house our team of website developers, web designers and online marketing experts provides consultation, strategic thinking, branding, brand positioning, brand development, artwork, graphics, video and a full range of online design solutions. DSBWorldWide is recognized as one of the top Web Site Design and Development firms in Dallas and North Texas, offering international and national level creative graphic agency services for businesses throughout the state of Texas and across the country. For more information about DSBWorldWide, Inc., visit www.dsbworldwide.com. The requirement for the TDLR approved Cosmetology License renewal courses are available on the TDLR Website. Once limited to celebrities and super-models, eyelash.. Ask a skin care pro for the three most important steps in..
Nail fungus is not a particularly appetizing topic to discuss..
More than 375,000 people work as nail technicians in salons..
2017 might have been the Year of the Eyebrow, but that.. When you hear the word, “formaldehyde,” chances are.. Nostalgia for the Good Ol’ Days is all well and good, but..
As the summer heats up, so does eye shadow trends, with.. Remember those rock bands of the 1980s, like Whitesnake, Guns..
SPF: How Much is Enough? Moisturizer for Acne Treatment? Yes! If you’ve read those charming prairie pioneer books like..
Lovely lashes that go on forever with no need of messy mascara..
You know you’re supposed to moisturize. Every beauty..
Acne. Yuck! Around 85 percent of Americans will experience an..
Flip the pages of beauty magazines for trends for 2018, and.. Eyebrows. Everybody has a couple of them, but it seems nobody..
Want to get a festive upgrade for your fingernails for that..
What’s your natural hair color? Do you even know anymore..
Neurocosmetics might sound like the preferred foundation makeup..